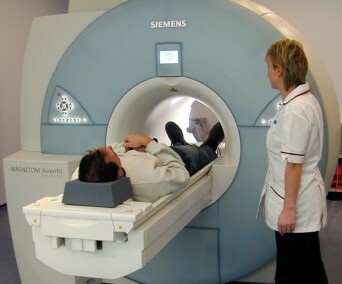 MRI is a technique which uses magnetism and radiowaves to image the patient. It avoids radiation and can reveal abnormalities that are not shown by other imaging techniques. There are also many specialist areas where MRI can produce revolutionary information – for example, MRI can image blood flow directly – so the blood vessels can be shown without injections. Fluid imaging can show the bile ducts without the need for a more invasive procedure. Similarly there are some occasions where MRI may be preferred to CT in the investigation of the chest or abdomen. It can use the diffusion of water to help show areas of malignancy, infection or ischaemia (stroke). We are always happy to advise on the best method of imaging for a particular problem. Intracranial clips e.g. from aneurysm surgery. Metallic bodies in the eye. Pacemakers, cochlear implants, spinal stimulators. A few cardiac valves, stents – many modern implants are MRI safe, so if the patient can provide details of the surgery, we can check if the scan can be performed. Although recent surgery can be a contraindication, well-established orthopaedic hardware such as hip replacements, bone plates and screws etc. is usually not a problem. Feel free to ask the Department, if you have any doubts. For safety reasons, a questionnaire is used to screen patients at the time of booking, and before entering the magnetic field.